They were the cowboys of Scotland, driving their cattle for mile after mile down from the Highlands or across from the islands. From as early as the 14th century, and growing to a peak in the 1800s, the drovers brought their black Highland beasts to market along pathways that traversed some of the most difficult landscapes in the country. The herds that plodded southwards were destined for the major markets where dealers from the Lowlands and England came to buy the beef that was so much in demand by growing urban populations. Up until the end of the 17th century, the autumn ‘tryst’, as the market was known, was held in Crieff. Every year, the town swelled with the arrival of tens of thousands of cattle, drovers, dealers and a host of others, from pedlars to gamblers, singers and jugglers, all plying their different trades. Noisy and riotous, but vital for the Perthshire economy, both the trysts and droving remained an annual feature of the local landscape until modern roads, steamships and railways meant that the English dealers could venture north to buy cattle direct, while the fatter, less hardy breeds of the 19th century could travel south in relative comfort. 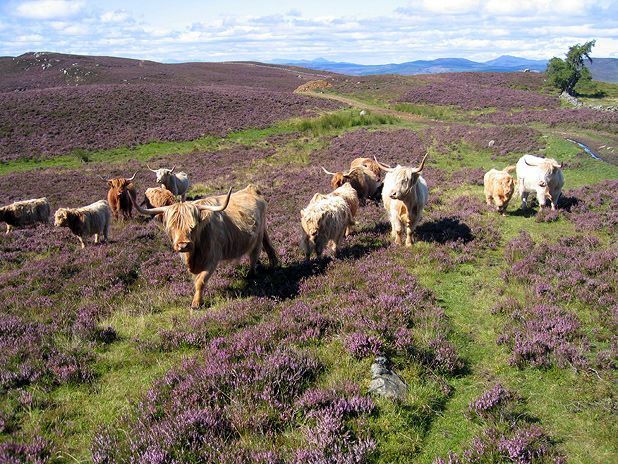 Today, you’re more likely to find mountain bikers and hikers taking to the ancient drovers’ roads, while the cattle of Perthshire have taken some very distinctive modern turns. On the 25,000 acres of Blackford Farm that sits astride the A9, there’s a cattle enterprise that has its roots in Japan, but its eyes fixed on an ambitious European target. Farmer Mohsin Altajir is not your regular Perthshire cattle breeder. Part of the family that owns mega-brand Highland Spring mineral water (which flows from the hills overlooking the farm and is bottled in Blackford village), he is on an ambitious mission to breed the most expensive beef in the world, the legendary Wagyu, in the country he believes has the finest reputation for beef in the world, Scotland. This extraordinary breed from Japan is famed for its extreme fat marbling, which makes for a heightened level of taste and tenderness, commanding headline-making prices of up to £200 a kilo for the prime cuts. Certainly, this is an aggressive undertaking, with a stated goal of being the European centre of Wagyu breeding and production within five years. This doesn’t mean that local breeds are taking a back seat. In fact, quite the opposite. Highland, Shorthorn and Angus cows are acting as surrogate mothers to produce the Rolls-Royce of beef. All the cattle are living well, with nearly 10,000 square metres of brand-new, state-of-the-farming-art sheds their home in winter. Besides pasture, meal times feature pre-cut hay, seaweed and omega oils. Mohsin and his wife Martine have plans for an on-farm butcher, and a range of Wagyu sausages and burgers are in the pipeline. For now, this pricey breed turns up in up-market restaurants, with orders also arriving from gourmet butchers in places like London. Following a very different path, and a somewhat more accessible one, is the beef enterprise of Hugh and Sascha Grierson. Their Newmilns farm is around eight miles west of Perth and went organic in 2000. They joined the growing band of farmers who have found selling direct to the public the only way to make small-scale farming pay. That has meant a careful breeding programme raising pure-bred Angus, and an on-farm butchery where butcher Moray MacDonald works four days a week, cutting and packaging the farm’s beef (and its lamb, poultry and pork). Other than from their farm shop and online outlet, you can buy Grierson Organic fresh meats at Perth Farmers’ market on the first Saturday of every month, along with the tasty all-organic beef burgers that keep shoppers well fed. Of course, the gentle atmosphere of a farmers’ market is a long, long way from the rough-and-ready trysts of the cattle drovers’ days, but it’s still a chance for locals to meet up with the people who actually rear their food. The Crieff trysts may have been one of Scotland’s original food festivals, but there’s still plenty to celebrate today when farmers bring their beasts to town.